Fiona introduces the quilt she made in response to a Quilters’ Guild ‘Best of Scotland’ challenge, featuring the ‘Delectable Mountains’ block and paisley fabric. 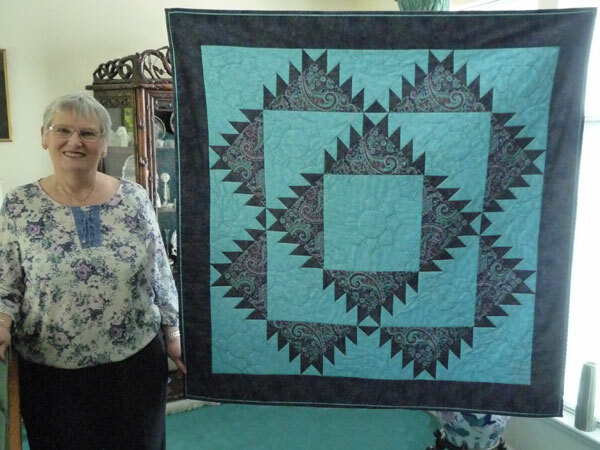 She talks about how important she feels it is for people, whatever their skill level, to enter quilt competitions. Fiona was born in Hong Kong and has lived and travelled all over the world; she discusses how this has influenced her choices of colours and fabrics, as well as it’s roll in initiating her interest in quilting. Later she talks about family links to sewing, and the importance of her quilting friends in her life and her husband’s support of her hobby. Barbara Gregor [BG]: Name of interviewee Fiona Callander, name of interviewer Barbara Gregor. We are in Fiona’s home [address] Newkirk, Mearnskirk, [address] and today’s date is the 19th March 2015. Hello Fiona, thank you for agreeing to be interviewed for the talking quilts project. You have your touchstone object with you today called Delectable Mountains. Can you tell me a little bit about your quilt? Fiona Callander [FC]: Yes, thank you very much. I made this quilt for The Quilters’ Guild of the British Isles Best of Scotland exhibition. It was to be entirely whatever we thought was the best of Scotland. I immediately had a flash that the mountains were the thing that made me admire Scotland most and luckily there is the traditional, em, block called delectable mountains, and I thought, ‘what better than that?’ so I had my topic. I then decided what am I going to make it in, no contest, the second best thing, in my opinion, about Scotland is paisley pattern fabric. So off I went to my stash of paisley to find what I had that would do for this project. I managed to find the main fabric and then the right shade of royal blue, also with the paisley on in gold. And then I did… and then I did need to buy the background and I chose turquoise as the colour that best created sky or water. So that is how I came about with this pattern and those colours. BG: It’s very beautiful of colours blue, how long did it take you to make. FC: I don’t think it took too long, but I seem to make things in, in a, one sort of stretch of a few days. I like to do all my piecing, and then I would properly just make the blocks, and I won’t actually… then I’ll have a break then I will later on, um, put all the blocks together, and then I’ll have another break have a few days or so and then I will put on my borders and after maybe a week or so, if I’m sure that I’m happy with it, because I’ll lay it out somewhere that I can go in and see it and come away, and go in and look at it again and come away, to see if there is anything that strikes me that I don’t like, because it gives your eyes a rest and if there is something and you just do it straight away and you have made a mistake somewhere it doesn’t always show. So I like to take my time and when I’ve decided yes that is perfectly what I want then I will layer it up on the floor in this room and then it will take me almost a day to layer up because my knees are not too good anymore and err I’ll do that in half an hour um slots with breaks in-between, so that’s usually how I work. BG: How do you feel about your quilt. Why did you make it? FC: I made it because I wanted to, I like to take part in err challenges because it makes me think, and it makes me perfect things, because I know other people will see it and I like to support The Guild when they are having any exhibitions. I like to take part, because if nobody takes part they don’t have any exhibition. And when I first went to Festival of Quilts my sister was with me and she found it really depressing that only… that she would never be able to be as good a quilter as the work that was in there. So I decided that when I first started quilting that I was going to take part in things because what you need to see at an exhibition, is not only the best peoples, it’s everybody’s work, so that somebody who is new would come along and say I could do that and that is why I have been entering Guild Challenges since I been quilting less than two years. BG: Thank you. It has a lovely hand stitch pattern on it would you care to describe that and why you have it there? FC: I wanted to use a good pattern that would fill the big spaces, and I had brought a template when I visited Houston that commemorated Christa McAuliffe who was the first teacher, lady teacher, who was going in to space and was going to teach classes from space, sadly that space shuttle blew up, and when I was in Houston they have a memorial side of, em, the quilt templates and they have them to commemorate lots of different people, famous people or wives of presidents or different things like that and I saw her name on this template, and I just thought have to use that in a quilt one day. And when I saw all the big spaces in this quilt and I know her name was Christa McAuliffe, I didn’t know if she was of Scottish decent or Irish, but I thought I’m going to use that because she was climbing a mountain for teaching, and as a woman, and I thought that would be perfect, most people think it looks like a thistle but it’s actually Christa McAuliffe’s. BG: Thank you. Do you want a break or happy to go on? FC: Happy to go on. BG: Do you have any future plan for your quilt at the moment? FC: Well I was going to send it down to an exhibition in… that the Traditional Quilt Group are having this year their 10th anniversary, and it would be going to the Bramble Patch for a month. However, I am bit disturbed about the fact that it’s, erm, very Scottish and there will be an election in a few weeks and I don’t know how the English people are going to feel about the Scottish people and as a British person myself I think I might just keep it at home and send something else, because now that it has won a rosette, my very first rosette. It’s more precious and I would not like anything to happen to it. Not that it would, but you never know. BG: Can you tell us what you won the rosette for? FC: It was the tradition and contemporary, competition at the ICHF Show called Stitching, Sewing and Quilting. Which took place at the SECC in March this year, and again I only put my quilt in to support them because it did not have to be newly made quilts. Because there wasn’t much time given and so I got a bronze rosette for that and, em, it was… I just like to see my quilts hanging somewhere, and if, if somebody sees it and says ‘oh I like what she has done there I can do that in my quilt’ then I think it’s worth it. BG: How did the rosette make you feel? 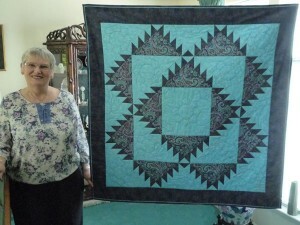 FC: I was amazed, I was amazed, because I’ve entered Quilt Show since I was a beginner, em, less than two years of quilting, and I entered shows. But what made me more amazed was the number of people that came up to me and said congratulations Fiona, and it’s about time too [laughter]. So that made me feel even better, because it wasn’t just one, it was more than one who came up with that. So I think that I’ve persevered and I haven’t been put off by the fact that I have not won anything and I still enter the Guild Challenge at Birmingham. And I never expect to win, and I never expect to win anything whenever I put things in because most often professionals are in the same category, um, when you are entering a Guild Competition and I know that one of them is going to win but that doesn’t mean that if you’re a Guild member your quite entitled to enter and you should to encourage others, we wouldn’t have a quilt show if only the best people ever entered. BG: That brings me on to your quilting background how did you get started quilting? 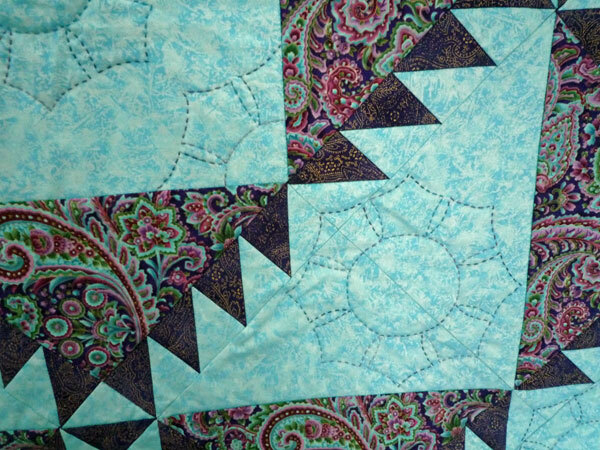 FC: I… many years ago was living in California and when I left California, after well, left San Francisco after two and a half years there, I was presented with a quilt, made for me, by the ladies on the committee of the Nursery School on which I was assisting. This was a total utter surprise, I was absolutely overwhelmed, I had no idea they were making it. I had no idea they were quilters. I was given this gorgeous quilt. Umm 12 blocks of things about San Francisco, or things that made them think of me, and err, I was so upset that I had actually not used the opportunity while I was there to learn to quilt, because in every country I ever lived in I always went and did handicrafts, but nobody… there wasn’t anything like that going on, and I never saw anyone doing anything like that, so it didn’t enter my head and I was just so disappointed that I hadn’t learnt that when I went to the next posting which was Singapore I was sitting next to an American girl and I was telling her about my quilt and she said ‘there’s someone in our church who teaches quilting could we go together because I would like to learn as well’. So we went along, well we put our names on the waiting list and waited and waited until we could go and I think I had four classes. We got a very quick move to, err to Macau so we had three weeks’ notice and I didn’t manage to finish the course which was something like 10 weeks. So I carried on moving round the world for the next ten years with little triangles and pieces pinned on to cardboard and I never found another patchwork group anywhere to help me finish it. We then retired to the UK and we moved house to where we are now and I went to church, erm, after about two weeks of going, after the coffee and after the service, there was a table with cards for sale and they were cross-stitch and there was some patchwork ones and I said to the lady ‘well I won’t buy the cross-stitch I do that myself if I sent that to someone I would feel guilty that I had not done it myself, but I don’t do patchwork so I’ll buy those ones’ and a voice behind me said ‘and why not!’ I’d only been there two weeks, I really didn’t know people and I turned round and here was this lady, Grace, and I just started stumbling to say, ‘well I, I started learning and then I got moved’, and she said ‘you need to come to our class’ and I said ‘are you sure it’s all right?’ Because my sisters group they can’t just take somebody along without checking. ‘It will be fine’. I said ‘Please check and then if it’s all right I’ll come’ and so the next Sunday she came up to me and she said ‘it’s perfectly all right,’ and she had it written in her diary, ‘for Fiona to come to the quilt group’. So I went along with my triangles and little squares I had pinned to cardboard and I assembled these three blocks and I joined them together and I now have this runner which I put a label on the back when I’d finished it saying ‘finished at last it took me 11 years’. However, the teacher there or the lady whose house it was decided that there was no way I was going to be making a sampler quilt if it took me so long to do three hand pieced blocks. So she decided that definitely a magic tile quilt was what I needed to do, because I needed to get on a bit faster. Magic tile has to be done on the machine and it is quite an exciting err quilt when you finish it because you don’t actually know where the pieces are going to be and what the quilt will look like. So I started on that, and I loved it, I just enjoyed it. I hand quilted it, but I pieced it on the machine because you have to and that… I never looked back from that I actually sent that quilt to be hung in an exhibition at Blair Castle that The Guild was giving and I, it was my first quilt really, but they didn’t have that category. Anyway it was just an exhibition and they hung it up high and I happen to know one of the ladies who was on duty near the end she said ‘You know Fiona the people that like your quilt best are the men they can’t work out how you get those pieces in those places’ because it’s quite a mathematical quilt and I’ve made that quilt numerous times especially for my godson and his brother, I do them in different colours, but you never know what’s going to be there at the end. So they look totally different and most of my family have a magic tile quilt and my husband was just saying the other day, ‘but I haven’t got one yet’, so I may well be making another one. But that’s really been the start, and then I went on to other things as well, but that one has been my first quilt. I really loved the pattern and I just can’t make enough of them. 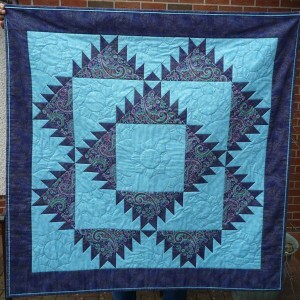 BG: Are there other quilters or stitchers in your family? FC: Oh yes, my mother was a brilliant seamstress. She made all my clothes when we were living in Hong Kong you couldn’t buy European clothes easily. And she loved nothing more than a challenge, if it was a vogue couture pattern that was better. She made coats, she made velvet dresses, she made… when I was growing up, she made evening dresses, she made my wedding dress, my going away suit, she even made the hat. My… her father had been a hatter and he had a business and his sisters were, um, tailoresses they made men’s suits. Of my mothers, the four girls on my mother’s family, my mother was definitely the expert when it came to making clothes, the others all made things, but not as up to the challenges as she did. And then she, er, did not have much patience with me when I was trying to sew because she could do it much quicker and much better. So I kind of veered away from it but she was great with my daughter who is now a textile designer. She spent four years at Galashiels Textile College. Erm and she inherited her love of sewing and challenges from me, but from my mother as well. I always say I’m not the slightest bit artistic because it’s not the art part of the quilt I like, it’s the geometry that I enjoy. I love choosing the colours and I love seeing the patterns come. I’m passionate about church floors and beautiful buildings with tiling on them, I’m not really interested in Art quilts with bit’s hanging off because I hear my mother’s voice saying ‘dust collectors!’ So I can’t get that out of my head. BG: Yes, how do you go about making a quilt where do you get your ideas how do you go about it? FC: Well, sometimes it’s a challenge and you’ve a size you’ve got to fit and the most difficult one I was given was, I took part in the British/Finnish Guild challenge where I sent four fat quarters and someone from Finland sent four fat quarters and I had to. They sent them to the respected Guild’s and they would send then out to the people that said they would take part. I received fabric that I would never in my life have dreamt of buying. My husband looked at it and he said ‘what are you making a deck chair?’ and I said ‘I don’t know’ because, I’m a traditional quilter this was too heavy to piece in the way I would normally piece, because it was quite weighty. So that gave me a lot of heartache and I kept thinking I can’t do anything in this because, a) I don’t like it very much, I don’t like the colours, I don’t like the patterns on it, I don’t like the feel of it, but I’ve got to do this because I’ve signed up to do it, and also you had to practice, that you would erm you to put so much percentage of their fabric so percentage of your own fabric and it had to be so much percentage of each of the different fabrics. So that was the one I enjoyed the least. However, when I made what I decided to make in the end, and I don’t really know where I got the idea, but I sent the photograph off and I was more shocked that I was asked to send it in. It was selected for the show at Birmingham and everyone who saw it there said ‘Fiona that’s not like you at all, are you moving into the arty things?’ I said ‘no that was a challenge’ and I managed to do it but it was not enjoyable. Most of the time when I am going to make a quilt I’ve brought the fabrics that I love and I can’t bear to leave on a shelf, not because I’ve got a quilt in mind, I usually end up buying material that I love and then I work out what I’m going to make it into, but I’ve never gone with a pattern of a quilt and brought the fabric for that pattern. I have a huge stash, I told my husband it’s a wonderful investment because the price of cotton now is very, very high, and I paid probably half that when I was buying my stash and it will last me for a long time. I’ve got quilts that I’m going to make I have the fabrics in packs all the stuff to make that quilt. I have about ten of these just waiting for the time but I will still take a challenge on, if there is a challenge for the traditional quilt group I will take part and so I will still buy something if I have to but I try to use things out of my stash but if you don’t make your quilt at the time you buy your material very often you, unless you collect it all together at the time, you find that the colours have slightly changed or the fashion slightly changed and you can’t get what you want with gold on it anymore or its gone into 1930’s and you have a far harder job getting other fabrics. So when I find something I really love, I then look for a pattern and buy the other fabrics while they’re still around so that I do have what I know I’m going to make and I put the pattern in with the material so that that quilt is still in my head and I know what it is going to be, because so often now you can’t get… people say ‘where did you get that all that Autumn fabric there is none around anymore’. When it goes through fashions so that one of the tips that I would give to anyone is to make sure that you collect all the things that are right for that quilt when you buy the material you love. Even if you don’t cut it up for 10 years. BG: What sort of fabric takes your fancy then what fabric do you like do you have a favourite theme or a colour scheme? FC: Yes, I buy oriental fabrics and that comes from my upbringing. I was born and raised in Hong Kong for 21 years and I left only when I married my husband. So I spent my childhood with oriental influences everywhere they just seem normal to me, they don’t, they don’t seem oriental that’s just normal for me, and so I’m drawn to them without even thinking about it. So I tend to buy a lot of oriental fabrics and also co-ordinating ones that have little flecks of gold or gold on them because that’s what I like and I think it’s properly been an absorbed thing over my life seeing all these exotic fabrics and so that’s what I think of as normal. But I do not use batik at all if I can help it because I once lived in Indonesia for two and a half years during which time everything I owned was batik; the curtains, the chair covers, the clothes you wore, and I don’t want any more batik because I’ve had enough of it. I’ve seen it printed, I’ve done all the things that you can do, going to classes, how to put the wax on etc, it doesn’t interest me as I was sickened of it I suppose. BG: So you mentioned that you are a Traditional quilter so do you have a particular block or favourite book that you use for something like that for getting your ideas? FC: One of my favourite blocks is Sisters Choice and I actually found that quite early on, and I made it in oriental’s and gold’s and I made one for my sister and one for myself and it’s quite a pretty block and you can use quite a lot of different fabrics in it and she was born in Scotland and I was born in Hong Kong, so I put paisley pattern in hers and I put oriental in mine and I made them the most similar and I sent hers to her and I still have mine and it hangs up and every time I look at it I think of her. And I think we are all quilting sisters and I have a quilting friend that we share, when we go to events we often share a room and so I make her a quilting sisters choice block but I do have another one that I really like called pathfinder and it’s contains 60 pieces, it’s 10 inches square and I make that for close friends when they turned 60 because there was a piece of fabric for every year of their life in that and I tended to do all in blue and white, like Chinese blue and white or willow pattern that kind of look and everyone who received it just couldn’t believe… I didn’t send a birthday card just the block. That was the happy birthday. I still haven’t made one for myself [laugh] I’m over 60 now [laughter] I’ll have to find another block with a few more pieces in it. FC: No. I don’t go on the web, I don’t have a computer and I know now that there are a few other people, well-known people out there, who are just like me. And my friends, who are on computers, can’t believe that I’m just not unique but there are well-known people and they don’t use computer and they don’t use mobile phones. And their quilts are soft and hand quilted and lovely just how I like a quilt. I use a machine that has no electronics, it is electric, it has a fabulous straight stitch perfect 1/4 inch seam allowance and that’s all I really need. A quilting foot goes on it and it is perfect. If I, and if I make a piece I know that my block is going to be exactly twelve and a half inches because the foot is exactly a perfect quarter inch, and that for a traditional quilt is the most important thing and a lot of people who don’t do traditional quilts, don’t do them because they can’t get a perfect 1/4 inch and their blocks don’t turn out right. So I have such success with my basic machine that I don’t need to go in to all these other computer things and I don’t really like heavy stitching I’m very happy to quilt in the ditch. I don’t actually really want to see the quilting in some pieces I really want the design to pop and I don’t really want the stitching to interfere with the lovely oriental fabrics that I have used because a lot of the time I don’t like certain quilts because I can’t decide whether I’m looking at the quilting pattern or whether I’m looking at the actual pattern of the quilt, the piecing, and a lot of the time I think it spoils… it does neither any good, so I’m very happy to stay… I do like to quilt in the ditch, and then, I like to hand quilt with Perle threads because now that I have arthritis if I’m going to hand quilt I really want to see it, I don’t want it just to disappear, so that’s… I still love doing the hand quilting but it has to be a thicker thread now. BG: You mention that you, you obviously quilt on the floor. Do you quilt at home all the time or do you go to classes at all? FC: I go to groups, erm, and I go to workshops. Often I go to workshops that are not traditional at all just so that I know how to do something. I may never do it again, but you learn, you get tips you learn from other people. Erm, I’ve done masterclasses in precision piecing with Philippa Naylor and my friends were horrified that I was going to go all for a whole weekend to learn how to precision piece when my precision piecing was fine. However, I said ‘well, I might learn something that will make it even easier for me’ and I jolly well did. It was worth going, I really learnt quite a few new tips that I have found make my life a bit easier, but I will go to some workshops, I don’t go for, sort of, 10, 10 classes in a row anymore but I go to groups where you can take your sewing machine and I go to groups where you have to do everything on your lap by hand. Sometimes it’s harder to have something at the right stage to take to the group where you’re sitting with something on your lap. No I’m not going to anymore classes and I do find I don’t go to classes when I’m at big festivals, because I find that too stressful for me. I like to go and enjoy the quilts and if I have to spend a whole day going to a class that takes the time out that I want to spend looking at quilts because I get ideas of different little things from other quilts. I don’t photograph quilts much, but make notes of what I like certain treatment of, a corner idea and I’ll write that down but I don’t need to have a photograph of a big quilt I’m not going to make that quilt I’m just going to take some elements of it and try to use them in my own. BG: You talked about craftsmanship and how you like to see your quilts standing out with… erm, stitching in the ditch when you go to a show or an exhibition what do you notice in other quilts, what do you take out of other quilts this maybe a reiteration actually, what do you take out of other quilts? FC: Well, one of the big things when I go to a show, is my husband is normally there as well, he is colour blind red, green so I take him along and I say to him show me a quilt that you like the colour of or that you like the pattern of, because I don’t know what he sees, so if he shows me a quilt and says ‘I really love the colours in that’ then I can note down what colours they were together that was pleasing for him to look at, because there’s no point in me making a quilt that he hates or can’t see that if, if you’re doing a Christmas red and green quilt and he just sees it all one colour I wouldn’t make that because I wouldn’t want to put all my effort into something that he is not going to like, it’s just to be nothing to him. So colour, the use of colour in different ways that is one thing I use him for and then I might not necessarily use those colours together myself, but if he sees it then I will. I also look at borders in a quilt and I like to see if anyone’s using any other little tricks and little treatments. 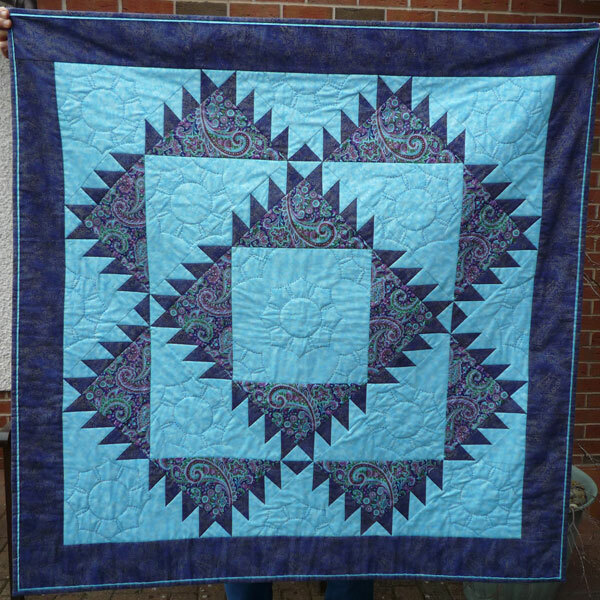 I once put a quilt in Birmingham and I put prairie points and buttons around in the border and that was one of the things that the judges admired when I got my critic back and I just felt it added another bit of a dimension. So I’m looking for a little thing like that not just prairie points, some people do take their blocks out the border in different way and that something I learnt form going to shows. Sometimes it’s maybe a way of combining different blocks together, erm that I hadn’t thought of using particular blocks that make another pattern, but then if its, if its… I like to see them if they’re going to be machine longarm quilted. I saw a fabulous one once it was Welsh and had beautiful dragons, probably because of the oriental-ness of it. And the quilting was custom done just for that quilt and I just loved it. So I’m not against erm machine quilting all over your quilt but it’s got to be specialised exactly for that quilt, not just an overall pattern. So when I’m looking at quilts now I take note of custom quilting at show to see what I might use. Because I can do that erm but it just gives you the idea, ‘oh now I see what they did there that useful I’ll put that down in my note book’ ,but I don’t or I don’t take a picture because you can’t always see the stitching when you take a photograph, if you’ve got the pic… the quilt, you haven’t actually got all the detail so it’s easier just to draw it, and I can still see that quilt in my mind, because it made such an impact, on it was black and red and gold, very oriental, but it was Welsh, and the quilting was… it was… a lot of it was in black but I got all the sort of shapes from it in here . BG: And you would use those in your own quilts later? FC: I might use them, I, I, think of them when I and I have a book called er Patterns and it’s really like oriental windows and different things like brick walls and things like that. And quite often I’ll look through that if I’m looking for some straight line, kind of, or I like doing window quilts I like not just attic window but looking through giving the impression of looking through and the oriental um bridges have lots of different shapes in them. They do have tiles, which have spaces in them, and I like to use that kind of work, because I’m a very symmetrical person and it comes from the balance in the oriental life of your yin and yang, and if everything is balanced then I feel relaxed and if something is not balanced I have it… if it’s A symmetric I have a real problem with it because I don’t feel relaxed, it offends me and I just, I get agitated so I think that partly living with unknowingly having absorbed things like that. So balance is the most important thing. BG: Would you say that balance makes a good quilt? FC: A lot of the time it does. BG: Would you add anything else into that to see what makes a good quilt. FC: Well, I think a quilt that makes you want cuddle up in it, is a good quilt now. I don’t really mind darker quilts or lighter quilts, but some colours, and I’m afraid yellow is a colour that I just don’t like. I don’t why I just I never buy yellow, I don’t wear yellow, I don’t own anything yellow, and if I see a yellow quilt I can still like it but I would never want to have it, but I think a good quilt… and I usually go round an exhibition and say which quilt would I like to take home from here if I was allowed to choose one and take it home, which one would it be, and it’s always one that invites you just to take it down and cuddle up in it. That’s what I like, it doesn’t matter how clever a design is, if it doesn’t sing to me then I don’t think it’s… you know it’s just another quilt. So if it sings… makes me want to take down and wrap it around me then I think that’s a good quilt. BG: You mentioned earlier that you got your ideas from many sources can you expand a little bit on that? FC: Well we go on holiday a lot and I get ideas from buildings that I see, erm, church floors, and I was lucky enough to go to the Golden Temple in Amritsar they have beautiful marble patchwork patterns all around the entire pool. They are in lots of different colours because in India the marble is available in loads of colours, so it’s not just your black and white and your beiges, maybe orange, they have lots of it and it was just… I couldn’t look at the Golden Temple I was so interested in the flooring [laughter]. So we take photographs of things like that, erm then when we went to see another’s it was a, erm, Amber fort. We went to and they had lovely geometric carvings like friendship stars on the columns outside and I’m thinking ‘wow what I could do a nice long narrow wall hanging of those’ [coughing]. So buildings and floors. I don’t go into a garden and think I want that, that isn’t how my mind works. I wouldn’t know where to start. If somebody says I want you to do something about springtime I go in to my reference books I go to my book of 501 blocks and I look for ones that say April or Spring this, something like that or maybe autumn tints rather than just a maple leaf it’s an autumn one. So my mind thinks in blocks. When I go and see things I don’t look and think oh I want to do that archway and the view through the arch way, but if I see a window that’s got an interesting er, different panes, different shapes of panes or if they are in stained glass, I might think ‘I’ll have a picture of that’ because I like that door not because of the shape of the door, but because of all the different colours and the lead-ness. So I quite like the use that kind of look, erm but I don’t get influenced by just surroundings and mountains and things, because if I think of something like rivers flowing, I will look up a block and think ‘O well yes I could have that watermill and that signifies water’ and then it doesn’t to the viewer if they don’t know what the bocks are. In my head I’ve got a library of blocks in my head. And one of my favourite blocks to use is snowball block because that’s very simple to do, and there are so many other blocks that you can put with it and it just looks so different. BG: You mentioned hand and machine quilting already do you always put hand quilting on all your quilts or do you always machine quilt them or is it always a variety? FC: Erm I always quilt in the ditch on machine, no matter what, because that then makes the design pop, and I think it’s an underrated erm skill, actually. It probably isn’t so important in a lot of kind of quilts but in the kinds I make the design is the thing, that is the shapes that are important and usually I will put some hand quilting on every quilt unless it’s one like a Ricky Timms convergence then I might not because there’s not really room, but most of them even if it’s a small block, yes, or I might even put buttons, I quite like putting buttons on. I also like stitching not just the quilting stitch but stitching the quilting stitch and threading another thread through it, err to make the pattern of the quilting stand out a bit more and it also sometimes introducing another colour where you feel it’s a bit bland. So I like to do that I’m not a great one for sequins, that kind of thing, but I will do French knots even, um, but I do like a book that tells you all these different stitches and how you can whip them and do all these things and if the quilt needs it, erm, I will, but because I use oriental fabrics I sometimes think there is too much, so I will quilt by hand, but I won’t smother it all. BG: When you’ve made all you quilts what do you do with them exhibitions, competitions and home or…? FC: Well I, I, make quilts for my friends grandchildren, because I don’t have any, I make them for my friends children even when they graduated or something like that because their older. All my family have quilts and usually they’re not even made, but sometimes made specifically for them if it’s a 30th birthday or a 21st birthday or a 40th I will make a quilt. They won’t get it for that birthday, but on that birthday I will get an idea and I will then make a quilt from the idea of that day and they might get it two years later or maybe a year later just depends, because once I’ve got the idea I’ve got to get the fabrics together. Usually I know what I’m going got make but it is strange, I was making a quilt for my elder daughter when she was 30 and I had brought this lovely fabric in Birmingham and it was all Japanese and it was like hocker size wave and she studied art at school and afterwards and I knew she just loved hocker size wave. So I brought all this fabric and I decided I was making this up out my head I didn’t use a book for what I was making, and I was trying to do a pool with balustrades all around it, but in different block ways of blocks. And unfortunately, there was a big tsunami and I couldn’t work on that quilt anymore because hocker size wave was the waves from a tsunami and I put it away for about six months or a year even and when I got it out again, the make it, to carry on with it, there was another tsunami and I was absolutely shocked and I thought that ‘this is terrible this quilt brings on a tsunami whenever I work on it’. So away it went again, eventually there was a third tsunami. We were in Hawaii and it happened when we were there and we were evacuated from our hotel up to a higher golf resort for a whole day while we sat and watched what was happening at the edge of the island with this water coming in and actually it dissipated it didn’t do any damage and, and I actually thought you know what I think I can get that back out again I got it out because the tsunami had passed and I got it back out and it was fine. And I made, finished the quilt. FC: But it was just, it was just really fluky how that happened, and she loves that quilt she has it hanging in her bedroom and she says I can see it from my bed and I see it every single day. So that was made just for her. It’s never been in any exhibitions at all but that’s just for her but sometimes I made them, just for the little challenges for the traditional group. I’m the rep for Region 16 for the traditional group if I don’t support the challenges, how can I ask all the ladies in the group to do it? So I take along mine and say ‘I’ve made one, have any of you made one?’ and they say ‘Oh, oh, no, but we will’ and so more quilts come. So I think that’s really why I like to take part in things and I like to encourage other people to take part. But if people really feel nervous or they don’t want to show their work I would never push them to do it, but once having encouraged my original teacher to enter a quilt show, she is now as enthusiastic about entering them and trying out new things and always says to me ‘so what are you going to do with this?’ and she says ‘if it hadn’t been for you I would not be doing all these things’. So it’s gone both ways she’s taught me lots but I’ve also given back to her the encouragement to enter things and she’s won prizes to. BG: How do you find time to do all these quilts? FC: [Laughs] my husband is a Qubby that’s a quilter’s husband who like quilts. He now does all the shopping, food shopping, and he does all the cooking and that’s why my friends say ‘that’s why you can make quilts because you don’t do the shopping, you don’t do the cooking, you got all that time’. I do, do other things, but that’s why they think that I make more quilts because I can come in from being out and I can just go and sew because I know dinner is on the way and I’m not having to do it. But I’ve often said to people ‘if I wake up in the morning I’m a Zen quilter’ I’ve read book about Zen quilt is something you want to make not something you what to have particularly. I might wake up in the morning about six o’clock and I’ve got an idea in my head. And I’ll just get up, put my dressing gown on and go to my sewing room an sew, and I might sit there and sew for a few hours because that’s when I want to do it and so somebody else might still be in bed and someone said to me ‘You mean you don’t do all your housework first’ I said ‘If I did all my housework first when would I ever have just the excitement of getting up and making something that’s come into your head in the night’. She looked at me as though I was crazy and I think well I’m a Zen person and you’re not. And that’s when I do it. And there was a Judy McAllister who lived in Arran she said she used to get up every morning at seven o’clock and quilt until eight every day. That was how she managed to fit in what she wanted to do and once it got to eight o’clock she would go and get dressed and go and do everything else, but from seven until eight every day was her quilting hour and I just thought why not. That’s a good idea. BG: What’s the biggest challenge you think that faces you as a quilter? FC: My stash! It’s overwhelming! [Laughs] I defiantly winning the prize to die with the biggest stash. I’ve got two girls who quilt, so I don’t think it will get sent off to the charity shop. It will be used sensibly but erm unfortunately I’m now taking over more of the house as they move out I gain another quilting room [laughter], and I’ve got, I’ve got… I don’t necessarily quilt in them all but I’ve stored quilting fabrics or quilts hanging on the walls. Em my husband thinks he has just one room left. But I do try not to put quilts in my sitting room, I do try not to have… there is one today but I try not to leave one in this room. I’ve had to clear the dining room today because it was covered in fabrics, although I have three sewing rooms upstairs. So that is my big challenge it’s not buying anymore fabric, but I won’t spoil a quilt by putting something in that I’ve got, if it’s not really right. So I’ve given myself permission to buy something if I can’t, make, finish a quilt without the right thing. So I’m not just going to only use what I’ve got because if I think that something else will just make the difference I’m still going to buy it. BG: Final question Fiona, Why is Quilting important in your life? FC: Well, it has helped me to make friends. I came back here after 30 years trailing around the world with my husband. Having been born and raised in Hong Kong, I had no school friends here I did not go to school here. I have few cousins and they’re quite far away, I didn’t know anybody. So I was used to going and meeting people overseas at different British women’s groups, you don’t have a British women’s group when you’re in Britain. So I tried a lot of different groups. I went to lots of different types of groups and I didn’t actually make any friends everyone was very pleasant but nobody really invited me back to anything or to go with them to something. Until I went to the patchwork and then I met lovely friendly people, who will phone up and say ‘let’s go to this’ or ‘came for a coffee’ and that’s where I made my friends. So to me quilting is something that anybody can do it so doesn’t matter how old you are how young you are or where you live or anything else about you, when you got to a quilt group you are with like-minded people, you don’t have to find a topic of conversation that you might have an interest in common, you have that already you have an interest, and you interest is quilting. So I think quilters are the friendliest people I have ever known they just come out and say ‘Oh sure I’ll show you how to do that’ and ‘come over to my place and we’ll do that together’ or ‘there’s and exhibition here why don’t we go’ and that has made all the difference to my life. Having moved around the world and been a bit of a nomad and it’s really helped me to settle here. And I also like the fact that everybody is working in different colours most of all the colours as I find Britain is a very drab colourless place compared to the countries I’ve lived in and I miss the colour so much that I can just go into my quilt room and I can get the colours out and I can be with colour and it lifts my mood and when I first came back to live here I owned no black clothes not a single black t-shirts or anything. And now my wardrobe is half black. But it’s the colour that I miss and in quilting the colour is there and if it is a horrible rainy dull cold day I just go into my sewing room open the drawers and tidy up my beautiful colours of fabric and then I feel happier again. So I, It raises your spirits and it just makes you happy to be able to say ‘oh well I think I will just make this’ and ‘I’m going to so and so’s patchwork group on Wednesday and I’ll do this’ and you know that you’re going to go there and you don’t have to wait to be invited you know it’s taking place that day and you just have to turn up and you’re going to meet all these friendly people that you have met. You might not see them in between, you might see them in-between, but its people who are quilting, who are more outgoing and welcoming and that’s why I still quilt and I wouldn’t do without it and my husband loves it. He comes down and he knows all the quilters and the traders and people like that at the Festival of Quilts in Birmingham. He wouldn’t miss it and that’s why he does the cooking and the cleaning shopping, so that I can still go and meet all these friends. BG: Fiona It’s been lovely talking to you today. BG: Thank you so much for interviewing with me it’s been a pleasure. FC: Thank you very much.